In advance of the Manics’ anniversary tour of The Holy Bible, the Cardiff production company Barefoot Rascals is making a short documentary on the album’s history and its impact on fans, involving interviews with Simon Price, myself and others. To get the film produced, we are asking for funding on Kickstarter – please donate a couple of quid here if you can. We are halfway to meeting the funding target so far. Below is a guest post and pictures by former music photographer Lorna Cort, who remembers the original album tour in 1994 and whose pictures will be used in the documentary. The Manic Street Preachers were my life. After discovering Stay Beautiful in the Summer of 1991 I’d followed tours, collected just about everything, written too many letters to James, learned to play guitar ( a white Gibson Les Paul obviously!) and helped form the band of fellow Manics fans ‘Dead End Dolls’. By 1994, I bought a camera and decided I was going to be a music photographer. I can’t remember who gave me a photo pass for Portsmouth Guildhall on 12th October but thank you, I have treasured the results. Back in the olden days of film and developing at Boots, I had no idea how the photos would turn out. As well as manual focus I had to contend with stage divers flying overhead, security guards taking up all the room in the photo pit, and the deafening sound of a thousand screaming fans 2 feet behind me and the flimsy barrier! 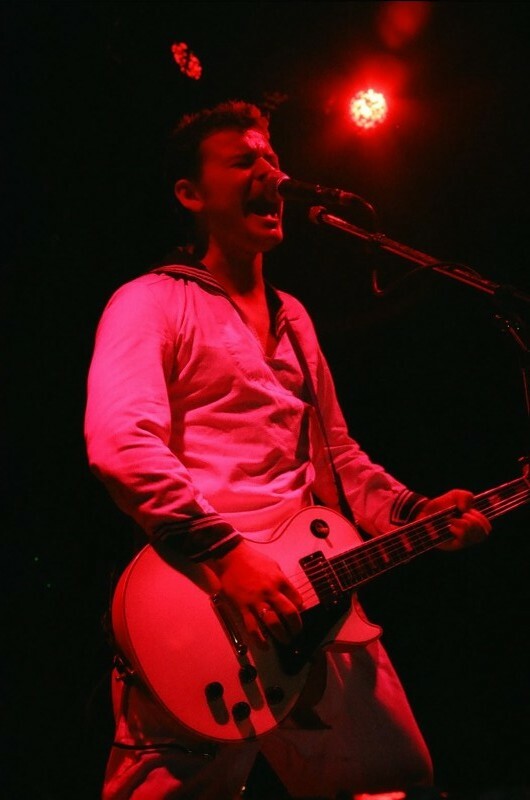 The gig was over in a flash, I remember James raised his eyebrows ‘hello’ at me, the white sailor suit looked amazing under the lights, the sound was incredible, I wanted to sing along but no, I was a photographer… I couldn’t look like I was actually enjoying myself! The Holy Bible was a challenge to listen to, it was at times uncomfortable, shocking, it was emotional… and it was perfect. When I look at my photos 20 years later I see the concentration on James’ face, the determination to get all the words out, Nick’s anonymity, head down with a nose-skimming fringe, and I see how painfully skinny Richey’s arms look, and that he has the word ‘LOVE’ written in black marker on his fingers. They were so beautiful, so focused. I wanted to be part of The Holy Bible – My Testament to share my photos with old fans and new, to celebrate one of the most amazing records ever created and to remember the excitement and love I had for this band. To paraphrase Nick – they remain the most intelligent people I ever met in my life. I so hope this project goes ahead and maybe brings the Holy Bible to new listeners. Thank you.